Senator Len Fasano of North Haven speaks at Republican press conference announcing budget. Today Senate and House Republicans shared a state budget proposal that closes the current projected state deficit over the next two years without new taxes and without pushing state expenses onto towns, cities or hospitals. The “Confident Connecticut” budget includes increased education funding with a new funding formula, restores money for core social services, and provides for significant structural changes to state government that roll out into the future. 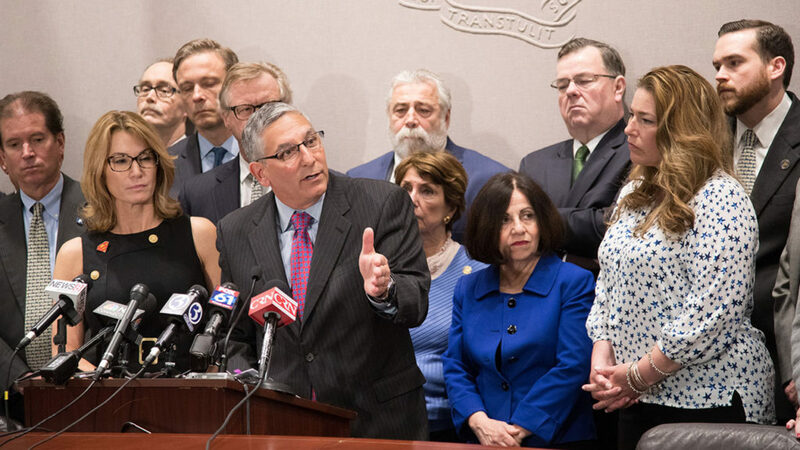 House Republican Leader Themis Klarides (R-Derby) said, “This budget puts Connecticut on a better path without tax increases; without shifting the state’s financial burdens onto towns, cities or hospitals; and without pushing off our obligations onto future generations. Democrats have repeatedly complained that Republicans had no plan. It turns out that it is the Democrats who failed to put out a budget and today refused to hold an Appropriations Committee meeting and denied us a vote on our plan,’’ Klarides said. “This budget streamlines government, reforms education aid to benefit more towns and cities with a new funding formula, provides predictability for towns and cities, and protects core social services for those who need them most,” said Senator Paul Formica (R-East Lyme), Co-Chair of the Appropriations Committee. “By creating stability and predictability for our state and municipalities we can encourage much needed confidence. With confidence comes jobs and economic growth. And with a healthy economy, comes a government that can reinvest in critical core services,” Representative Melissa Ziobron (R- East Haddam), ranking member of the Appropriations Committee. The “Confident Connecticut” budget rejects a proposal to require municipalities to assume a portion of the costs associated with teacher retirement. This will save towns from over $400 million in new financial burdens – a savings that multiplies significantly each year in the future. This budget eliminates the state’s Municipal Revenue Sharing Account program and instead reformulates municipal funding by establishing a new education funding formula. Almost all municipalities fare significantly better than under the governor’s proposal. No towns receive less state funding in fiscal year 2018 than enacted in fiscal year 2017. The budget also contains municipal mandate relief to help towns manage their budgets and identify savings for local taxpayers. This budget includes a fully revised Education Cost Sharing Formula that takes into account factors regarding CCJEF and Meskill court decisions, enrollment, poverty and wealth. In addition, this budget dedicates $33.6 million more to education in fiscal year 2018 and $136.6 million more in fiscal year 2019. Once fully implemented, the state will be spending $678.7 million more on education funding under this proposal. In 2018 all towns and cities will either be held harmless or gain more funding for education needs. This budget rejects a proposal to eliminate the tax exempt status for hospitals, and therefore protects hospitals from being subject to a new local tax. This budget preserves the small hospital pool to protect funding for community hospitals and does not increase the current hospital tax. It also reinstates hospital Payment in Lieu of Taxes to towns and cities. Budgeting is about priorities. This budget prioritizes core social services for the most vulnerable as well as important health and public safety programs. In order to preserve the safety net of services for the disabled, poor, those with mental health needs, children, the elderly and those in poverty, this budget rejects proposed cuts to many direct services and restores funding for core functions of government. For example, this budget fully funds Meals on Wheels, Care4Kids, day services and employment opportunities for those with developmental disabilities, and mental health and substance abuse grants. This budget would enact the Republican “Prioritize Progress” transportation funding plan which dedicates $63 billion to transportation needs over 30 years without tolls or new taxes. In addition to the funding plan, this budget includes a plan to make the state’s Special Transportation Fund solvent in future years by dedicating transportation related revenue to the fund and weening the General Fund off of transportation related revenue. Currently, the fund is in danger of being in deficit by fiscal year 2020. This budget resolves that issue for future years. In addition to addressing the deficit over the next two years, this budget includes changes to the structure of government that will roll out into the future to create savings for future generations. Recognizing that the state needs to rethink the current size and shape of state government, this budget recommends consolidating duplicative administrative functions and privatizing certain functions to best protect core services and enhance efficiencies. In addition, this budget contains an extensive list of policy changes to put the state on a better path in future years.